All of us have been there. You plan to eat healthily and frugally, but you drop into the shops when you are hungry; you come home late from work and order a takeaway, and you end up throwing out half the contents of the fridge uneaten because it has passed its use-by date. You are not alone. A 2014 study estimated that $31 million of food ends up in landfill in Canada every year. Even without the environmental impact, that’s a lot of money to end up in the trash! You can try to reduce waste by planning your weekly menu out in advance, but that doesn’t always work – the unexpected happens, and you’re not always in the mood to make that exotic dish that requires an hour of food prep time when you get in from a busy day. 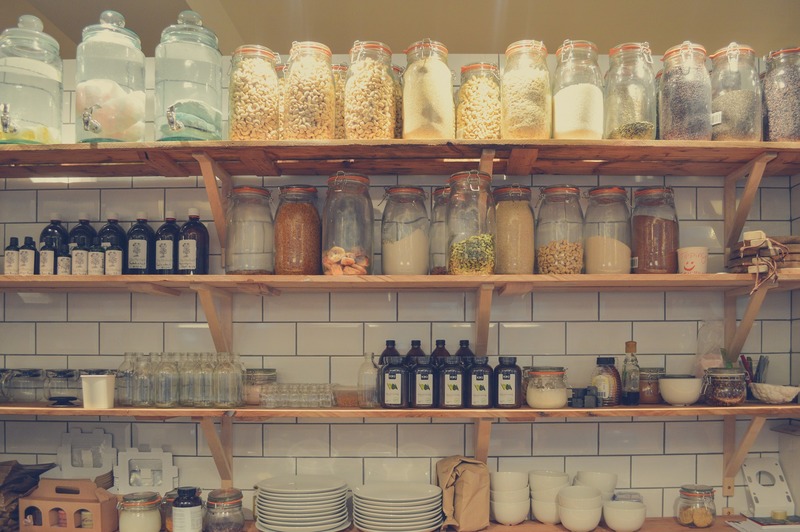 A simpler and more flexible way to reduce your food costs and waste is to stock your pantry with Store Cupboard Basics – a small number of essential ingredients that you can buy cheaply in bulk that will keep for a long period of time, and only need to be supplemented by some perishables – such as milk, eggs and fruit and veg – in your daily or weekly shop. Rice – the world’s most common staple food, rice is incredibly versatile – with basic cooking skills, it can be turned into soups, stews, paella, risotto and rice pudding. White rice can be bought incredibly cheaply in large quantities and lasts more or less forever as long as it is stored correctly. Tomato paste/sauce – these can also be brought very cheaply – particularly if you use supermarkets’ own brand – and form an instant base for soups, stews and sauces of all kinds. For the quickest meal of all, heat them in a pan and add to pasta with some salt and black pepper – quicker and tastier than any takeaway, and much healthier too! Frozen green veg – technically a freezer rather than a cupboard item, these are considerably cheaper and last much longer than leafy fresh veg, and still contain B vitamins and flavonoids, as they are frozen within seconds of being harvested. Salt and Pepper grinders – so they are easily forgotten, salt and pepper impart an enormous amount of flavour to everything from pasta and green veg to sauces and stir fries during the cooking process. Grinding them straight before use imparts a greater depth to their flavours. Fresh growing herbs – these can be bought from supermarkets and markets and cultivated in your garden or windowsill. Whether it’s leafy basil or woody rosemary, these can impart an amazing amount of flavour for very little work. Lemon juice – lasting much longer and easier to store than fresh lemons, this adds a fresh citrus zing and plenty of vitamin C to sauces and sweets. Flour – a must for home baking, this is also vital for thickening sauces and stews. It can be bought cheaply in large quantities and lasts for a long time as if stored in a cool dark place. If you follow the paleo/keto diets, you can always substitute with coconut or almond flour. Stock cubes or stock pots – a vital base for soups and stews, they can also be mixed with a little oil to add a greater depth of flavour to sauces and gravies.